Elaborately decorated cabinets like this one were made to protect and enshrine sacred texts in Buddhist temples in Thailand. 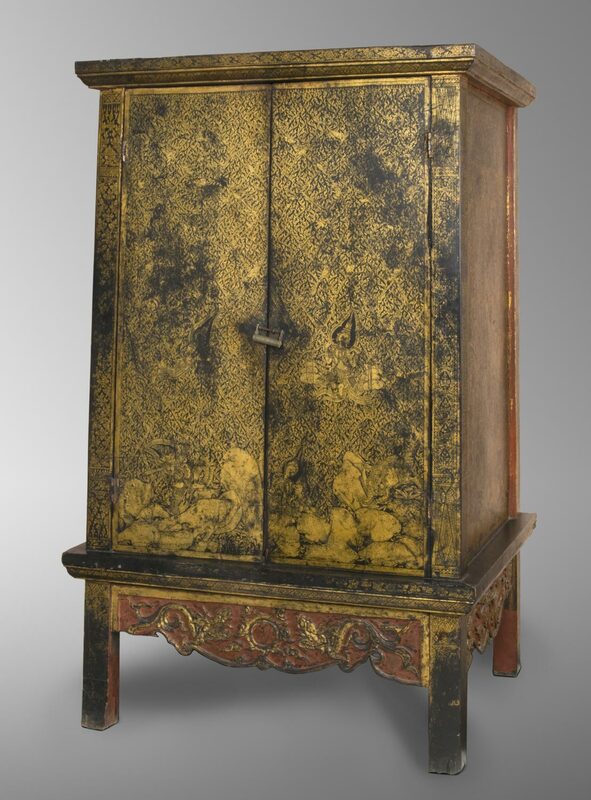 The exquisitely detailed designs adorning this piece, consisting of lacquer and gold leaf applied to a base of teak wood, required great skill to accomplish; Thai craftsmen had no opportunity to correct or enhance their work and the process was labor intensive and expensive. The figures on this cabinet—set amid semiabstract, luxuriant tropical vegetation¬—are based on tales from the Ramayana (Legend of Lord Rama), one of the great religious texts of India.